A project started a little over 4-5 years ago when I was just starting to explore the world of quilting. The shop assistant of my then favorite quilting shop gave me a mini-lesson on Paper Piecing after I asked her about a gorgeous little japanese hexagon quilt on display in the store. It was close to summer holiday time, and she told me that this was an excellent thing to do while on holiday, because it was easy to take along and took up little space. It sounded like a good idea, so I bought the last package of 3/4 inch hexagons, a few charm packets, and a sweet little sewing box to put my sewing gear in, and I was on my way. 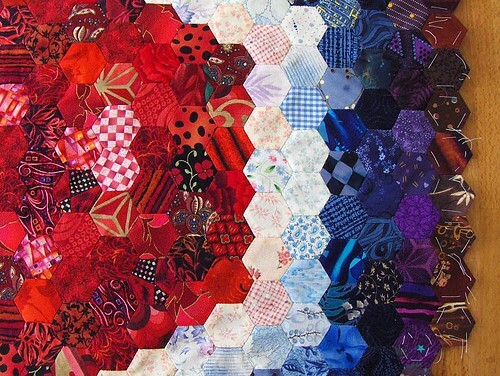 A few weeks later I was making the little hexagons in the car while not on co-pilot duty helping to pass the time, and sewing them together in front of a crackling fire during cool summer evenings in our little house. The colors of the Marc Chagal Church windows inspired the color choices at the time. The red, white and blue was all done on holidays in France, but for a few reasons ended up in the closet while other projects moved up the line. I had recently pulled it out of the closet to make for my friends' little baby, since the new mother loves bright jewel tones, but after she saw the original fabrics I had intended to use (soft vintage pastels) she decided that she liked those instead. Pffft! So now my little hexagons will become the take along project on holidays or time-killers in the waiting room. Bless your heart.....been there...done that...too! then you know what it is!